Fun With Puzzles Brain Teasers Find the Mistake Observation Test Picture Puzzles Puzzles Puzzles for Adults Puzzles for Teens What is Wrong in this Picture? Now test your visual observational skills. 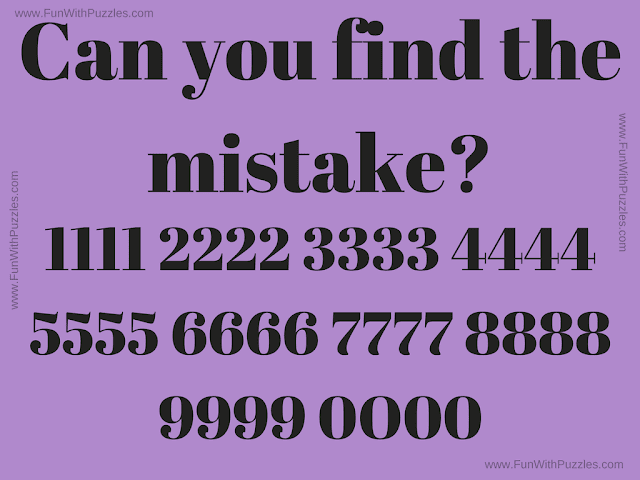 In this Puzzle picture there is some text and sequence of numbers is given. However something is wrong with this picture. There is one small mistake in this picture. This mistake can be anywhere in the text or in the given number sequence. So can you observe this picture carefully and find out what's wrong in this picture? Can you find what is Wrong in this Picture? Answer of this "What's Wrong in this Picture? ", can be viewed by clicking on button. Please do give your best try before looking at the answer. Letter 'O' is inserted in between numbers 0.